Bedbugs are small nocturnal insects of the family Cimicidae that live by hematophagy, that is by feeding on the blood of humans and other warm-blooded hosts. 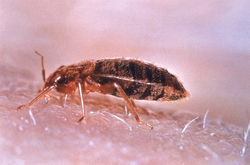 The common bedbug is best adapted to human environments. Adult bedbugs are reddish brown, flattened, oval, and wingless, with microscopic hairs that give them a banded appearance. A common misconception is that they are not visible to the naked eye. Adults grow to 4 to 5 mm (one-eighth to three-sixteenths of an inch) in length and do not move quickly enough to escape the notice of an attentive observer. Newly hatched nymphs are translucent, lighter in color. Full size Bedbugs can be compared to an apple seed. Bedbugs are generally active only at dawn, with a peak attack period about an hour before dawn, though given the opportunity, they will attempt to feed at other parts of the day. Attracted by warmth and the presence of carbon dioxide. Bedbugs may be erroneously associated with filth and severe infestations are often associated with poor housekeeping and clutter. But, Bedbugs are attracted by exhaled carbon dioxide and body heat, not by dirt, and they feed on blood, not waste. 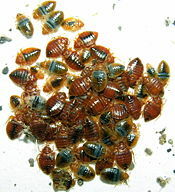 In short, cleanliness of there environments has to do with the control of bedbugs, but unlike cockroaches, does not have direct effect on bedbugs as they feed on there host and not waste. Female bedbugs can lay up to five eggs in a day and 500 during a lifetime. Bedbugs are very flat, which allows them to hide in tiny crevices. A crack wide enough to fit the edge of a credit card can harbor bedbugs (even in the ceiling). Bedbugs are capable of traveling as far as 100 feet to feed, but usually remain close to the host in bedrooms or on sofas. Confirmation of the presence of bedbugs may be through identification of the insects collected. If you have a feeling you may have bedbugs and have been able to collect a few of the tiny bugs for inspection, Give our office a call and we will be happy to do a free inspection.